Producer prices are down again this month followed by an unexpected rise last month. 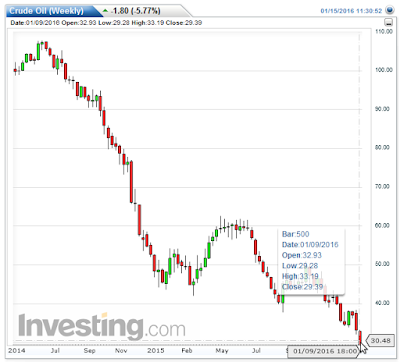 If oil prices stick, expect more of the same next month. Crude is down $1.80 today, another 5.77%, to a new interim low of $29.28. The session is not over yet so it remains to be seen if today is the first close below $30 since 2003. The Econoday Consensus Estimate was -0.1%, and the actual headline number -0.2%. The producer price-final demand headline in December fell 0.2 percent, nearly reversing November's 0.3 percent increase which now, regrettably, looks like an upside outlier. Year-on-year, the headline is down 1.0 percent. The ex-gas ex-food core rate did rise, but only 0.1 percent while the year-on-year rate is down 2 tenths in the month to only plus 0.3 percent. The ex-gas ex-food ex-services headline is up 0.2 percent with the year-on-year rate unchanged, also at plus 0.3 percent. Services are the disappointment in this report, unchanged in the month following November's 0.5 percent bounce back that followed, however, two prior months of decline. Lack of price traction in services is a blow to Federal Reserve policy makers who are counting on improvement in domestic prices to offset ongoing contraction in fuel and commodity prices. Year-on-year, service prices are up only 0.4 percent. Energy prices fell 3.4 percent in the month with the year-on-year rate at minus 16.2 percent. Food prices, which have been another source of weakness, fell 1.3 percent with the year-on-year rate at minus 5.2 percent. Two other areas of weakness are export prices, down 0.1 percent and 3.4 percent year-on-year, and also, in bad news for manufacturers, finished goods prices which fell 0.7 percent and are down 2.7 percent on the year. Construction prices, which have been a source of strength, were unchanged though up 1.8 percent on the year. 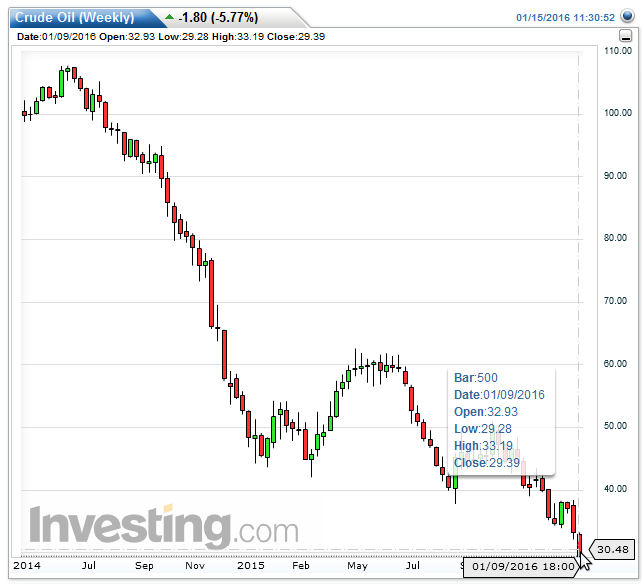 This report for November did show promise but not in December and it isn't a source of optimism going into the January price collapse for oil which, for WTI, is struggling to stay over $30 this morning. This along with yesterday's import & export price report will not boost confidence that inflation expectations are well anchored and that inflation itself moving higher. Watch next Wednesday for the consumer price report. Bloomberg reports "Services are the disappointment in this report, unchanged in the month following November's 0.5 percent bounce..."
Bloomberg has an error. The services component rose 0.1%. Let's dive into the BLS PPI Report to verify. Final Demand Goods: The index for final demand goods moved down 0.7 percent in December, the sixth consecutive decrease. Over three-quarters of the December decline can be traced to prices for final demand energy, which fell 3.4 percent. The index for final demand foods decreased 1.3 percent. Conversely, prices for final demand goods less foods and energy inched up 0.1 percent. Product Detail: About half of the December drop in the index for final demand goods is attributable to prices for gasoline, which fell 8.3 percent. The indexes for meats, diesel fuel, chicken eggs, jet fuel, and fresh fruits and melons also moved lower. In contrast, prices for pharmaceutical preparations rose 1.1 percent. The indexes for fresh and dry vegetables and for home heating oil also increased. Product Detail: Leading the December advance in the index for final demand services, prices for services related to securities brokerage and dealing jumped 30.3 percent. The indexes for machinery, equipment, parts, and supplies wholesaling; physician care; food retailing; and hospital inpatient care also moved higher. In contrast, margins for apparel, jewelry, footwear, and accessories retailing fell 3.4 percent. The indexes for loan services (partial); TV, video, and photographic equipment and supplies retailing; and airline passenger services also fell. Prices for services related to securities brokerage and dealing jumped 30.3 percent. How inspiring.